Eliminate unnecessary duplicate files, recover critical hard disk space, and accelerate computer performance. Regains critical hard disk space. It finds and deletes duplicate files in order to regain valuable hard disk space required for smooth computer operation. Are You an Active PC User? 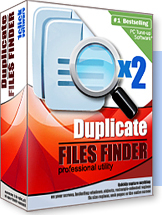 Digeus Duplicate Files Finder is for you! If you are like millions of other PC users, you download a variety of files onto your computer - photos, music, videos, documents, applications, and you may share those files with your friends. Whenever you download such files, your computer creates and stores duplicate files, which collectively slows your computer down and crashes your system. When You Think Download, Think Digeus. Digeus Duplicate Files Finder finds and deletes duplicate files so you will receive optimum computer performance and eliminate crashes. Our FREE, two-minute computer scan will show you how many duplicate files you have that are slowing your computer down. Duplicate Files Finder is already included into All-in-One System Optimizer suite.